The shocking and sad news of the passing of beloved Mayor/Governor/Senator George Voinovich came just a day or so after his appearance at the Republic of Slovenia 25th Independence Day celebration in Cleveland City Hall. 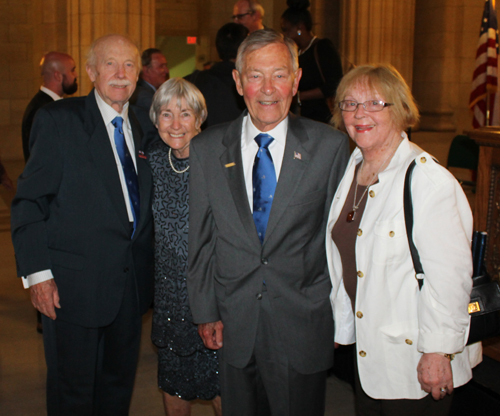 We saw Sen. Voinovich at the Slovenian Independence Day event and he looked healthy and sharp. His ad lib speech when called to the podium was classic George Voinovich - humble, smart and caring. A flag dedication and centennial celebration in the British Cultural Garden took place Sunday morning and the sad news spread quickly. George Voinovich loved the Cleveland Cultural Gardens, especially the Slovenian and Serbian Gardens of his heritage. Several leaders wanted to pay tribute to Senator George Voinovich. Chris Ronayne, President of University Circle Inc. in Cleveland, told how George Voinovich was a part of Cleveland. Sheila Murphy Crawford, president of the Cleveland Cultural Gardens Federation, and her family knew George Voinovich and his family for many years. In fact, George Voinovich was her paperboy. Sheila spoke from a personal perspective and also representing the Gardens. Erika Puussaar, a Director of the Cleveland Cultural Gardens Federation and delegate to the Estonian Garden, told how grateful the people of the Baltic States of Estonia, Latvia and Lithuania were to Senator George Voinovich for his work to get the Baltics into NATO. Paul Burik, past-president of the Cleveland Cultural Gardens Federation, spoke about the Serbian and Slovenian Gardens and how the Eastern European community owed much to Senator Voinovich. Moments of silence in honor of George Voinovich were held at both the Flag Dedication ceremony and British Garden Centennial event. Senator Rob Portman spoke at the 80th anniversary celebration of the Lithuanian Cultural Garden in Cleveland on September 18, 2016. After the event he was asked if his expertise with the Baltic States, Ukraine and Eastern Europe and his strong relationships with the ethnic groups came from the late Senator George Voinovich. Senator Voinovich was supposed to meet his longtime friend Alex Machaskee, retired publisher of the Cleveland Plain Dealer and honorary Consul of the Republic of Serbia, at the dedication of the bust of Mileva Maric the Serbian physicist and mathematician who was the wife and scientific partner of Albert Einstein, in the Serbian Cultural Garden on June 19, 2016. Of course his untimely passing prevented this from happening. Mr. Machaskee spoke about the Senator in this video clip. The American Nationalities Movement held the annual Captive Nations Dinner in Cleveland on July 14, 2016. The event began with a tribute to George Voinovich from Alex Machaskee and August Pust. In this video clip, August Pust told a story about his last dinner and event with Senator Voinovich. 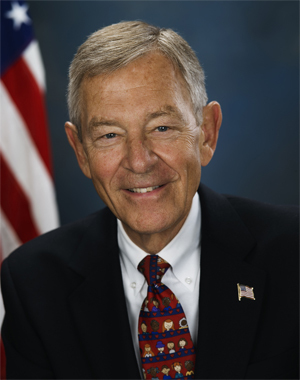 From his time as member of the Ohio House of Representatives, Cuyahoga County Commissioner, Lieutenant Governor of Ohio, Mayor of Cleveland and Governor of Ohio, to his present role as Ohio's senior United States Senator, George V. Voinovich has strived for more than 40 years to make all levels of government "work harder and smarter and do more with less." As mayor of Cleveland, USA Today credited him with "turning the nation's 22nd largest city from a laughingstock in the 1970s into a three-time All-America City winner during the 1980s" after Cleveland became the first major city to declare bankruptcy since the Depression. His work rebuilding the city through public-private partnerships earned him praise from the National Urban Coalition, which hailed him as one of four distinguished urban mayors in America. Over the last decade, Senator Voinovich has also been actively involved in crafting America's foreign and national security policies. He used his status as a five-year member of the Senate Foreign Relations Committee to conduct oversight of U.S. foreign policy in the most critical parts of the world, including Iraq, Afghanistan, Iran, North Korea, the Balkans and former Captive Nations in Eastern Europe. Proud of his Serbian father (who was secretary of the Yugoslav Cultural garden in the 1930's) and his Slovenian mother, Collinwood's own often says "I have found over the years that those people who are proud of their ethnic heritage are great Americans." With all Sen. Voinovich has accomplished, he calls Janet, his wife of 47 years, God's greatest blessing on him. We heard George Voinovich say many times over the years a statement (paraphrased here) that "People who respect and embrace their ethnic heritage are great Americans." We couldn't agree more and we will all greatly miss him. He was truly a man of Cleveland. Condolences to his wife Janet and their family and friends. Rest in Peace. Back to 25th Slovenian Independence Day program. Back to People Page of 25th Slovenian Independence Day.